Copperhead Vol. 3, by Jay Faerber, Drew Moss, Ron Riley and Thomas Mauer, Published by Image Comics. 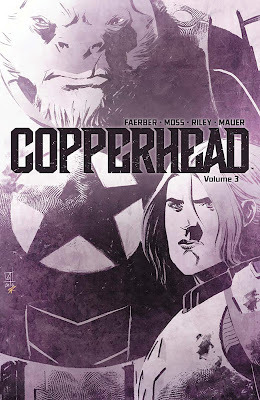 Copperhead is a book that I think has gone a little under the radar, but it's a great read for anyone looking for smart, fun, entertaining comics that also thoughtfully deal with complex social issues. It's a future-set story about a small-town sheriff named Clara Bronson, who's also a single mom...and who also happens to be sheriff of a town called Copperhead, on an alien world. Her deputy is a member of a species that fought against humans, she has a complex relationship with an android. The story deftly mixes crime solving with broader social issues, and this third arc doesn't miss a beat. The art changes from Scott Godlewski to Drew Moss, and while Godlewski is a fantastic artist, Moss ably steps in and brings a similarly fun, dynamic style to the book. 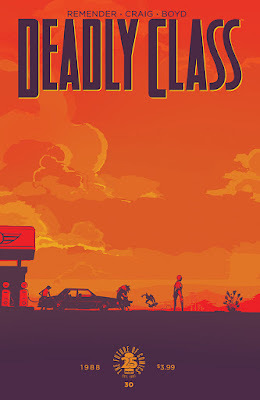 Deadly Class #30, by Rick Remender, Wes Craig and Jordan Boyd, Published by Image Comics.Deadly Class had an easy hook, "high school for teenage assassins set in the 80's". I was signed up instantly, this was an easy sell for me from the get go. I expected a fun,crazy book. 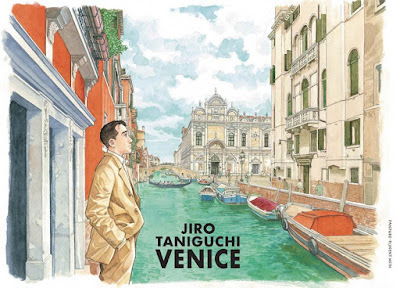 What I didn't expect was that it was going to be some of the most emotionally raw, honest storytelling about depression that I've ever read, not just in a comic, but anywhere. Remender really lays all of his inner turmoil and darkness out there for the reader to see, and it makes for a stunning read. Speaking of stunning, that's the word I continue to need to use to describe Wes Craig's art. Craig's work continues to be a revelation to me, as it's exaggerated and fluid and violent and over-the-top and always compelling. Jordan Boyd provides explosive, atmospheric colors in the book, continuing the great work started by Lee Loughridge. Deadly Class continues to be an amazing book, full of complex, emotional, real storytelling...along with wannabe teenage assassins set to the punk-rock sounds of the late 80's. 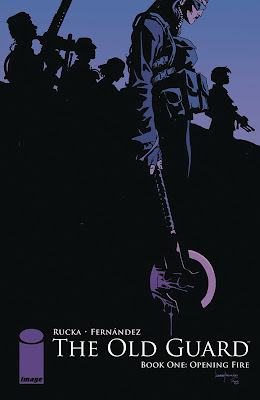 The Old Guard Book 1, by Greg Rucka, Leandro Fernandez and Daniela Miwa, Published by Image Comics. It's a story by Greg Rucka, so you can rest assured that you're getting a well-told story with great dialogue and thoughtful characterization, along with a complex, interesting female lead. Good news - you're getting all of that, and it's a story about people who are functionally immortal. The story is brought to life by the gorgeous, fluidly exaggerated art of Leandro Fernandez, and the stunning, atmospheric colors from Daniela Miwa. This is just a great read. These are people who in some cases have been around for thousands of years, and they move from place to place working as mercenaries. In the modern world, it's gotten harder to hide who they really are, which makes for a fantastic page-turner of a story. 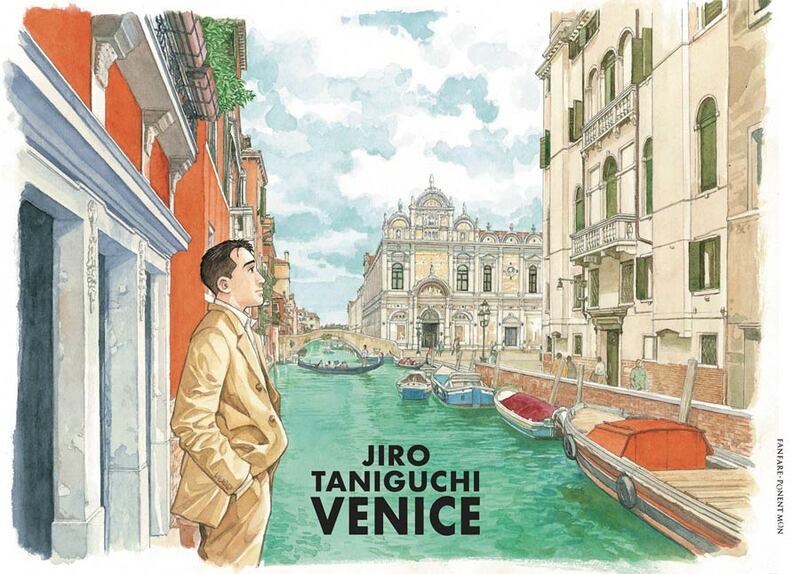 Jupiter's Legacy Vol. 2, by Mark Millar and Frank Quitely, Published by Image Comics. 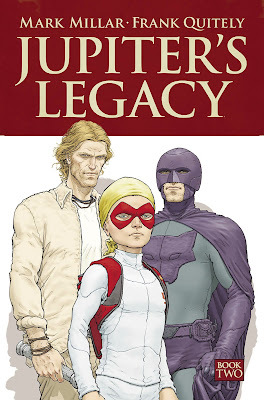 Jupiter's Legacy is Mark Millar's more thoughtful, nuanced take on the world of superheroes, and he's telling a highly engaging, entertaining story about the golden age of heroes, and the less-golden descendants that followed those greats. It's a great story that explores dueling visions of what the purpose of a superhero is. But of course, one of the main reasons to pick this story up is also that it's illustrated by the incomparable Frank Quitely. Quitely brings his unique visual flair to this comic and brings every page to life. He's one of the best I've ever seen at depicting action that's exciting and dynamic but also easy to follow. All of his various skills are on display here, and this is definitely a fun read worth considering. 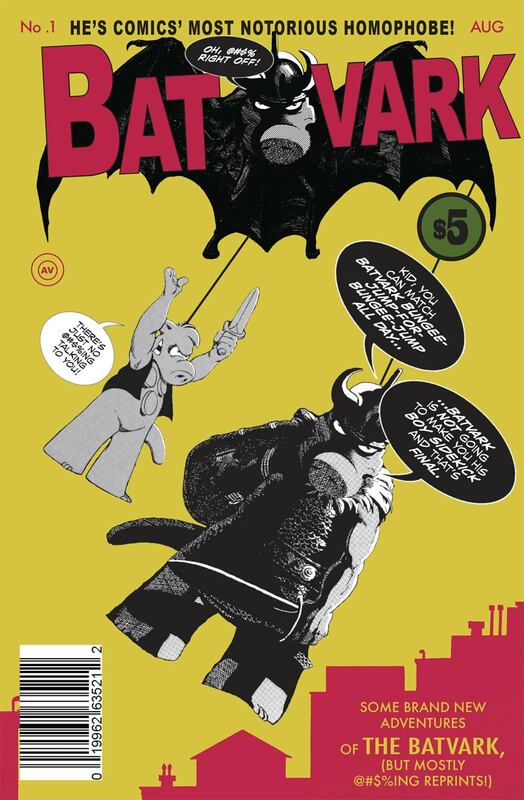 Batvark #1 by Dave Sim, Sandeep Atwal and Gustave Dore, Published by Aardvark Vanaheim. Sigh. I honestly really don't know about this one (which I think says a lot about this week in comics.) Sim is basically remixing his old comics with Gustave Dore's prints. 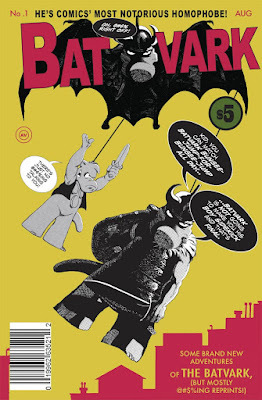 Celebrating the 40th anniversary of Cerebus, Dave Sim is basically sampling artwork. I don't know if it's any good but that Sim can do this is basically the justification for the creator ownership and self-publishing movement that he lead decades ago. 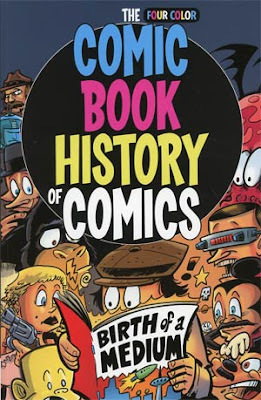 Comic Book History of Comics: Birth of a Medium by Fred Van Lente and Ryan Dunleavy, Published by IDW Publishing. As a story about comic books, Van Lente and Dunlavey construct this fascinating look at the first century of comic books, beginning with the unlimited possibilities of the Yellow Kid and oddly ending on a warning note of digital piracy. For a book that stays to the facts (no matter how skewed or satirically they may be portrayed) for most of its lengths, Van Lente and Dunlavey end on a heavy handed op-ed about the affects of piracy on the medium that they’ve decided to work in. Factual or not, their final editorializing injects their own authorial concerns over a history where they remain mostly as chroniclers and not commenters.